Death's a joke and life a sewer! If ever a theatre production was ripe for audio description this was it! Dead Dog in a Suitcase, a remake of Gay's eighteenth-century Beggar's Opera by the UK Kneehigh Theatre Company was a sensory feast of sound, evocative lighting and action. There were eclectic styles of singing and music, dancing, snappy dialogue, puppets, guns and a cement mixer, an unsavoury loo, pole dancing, and the dead dog in a suitcase of urban myth, complete with puppet flies. Top marks to Amanda Baker and Shona McNeil for their skilled audio description of the organised mayhem. Dead Dog was spectacular, funny, wild, scatological, bawdy, profound, gloriously loud at times, and achingly intimate at others. It was pacey, exuberant, cleverly staged, profoundly human and deeply satisfying. The touch tour before the show was critical because the set was complex. 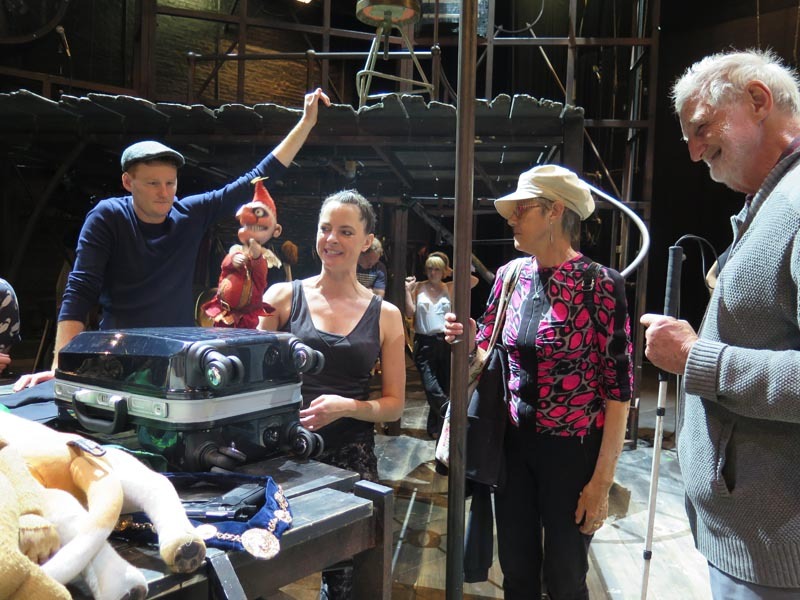 Taking the touch tour is an opportunity that should always be embraced by blind and vision impaired theatregoers. 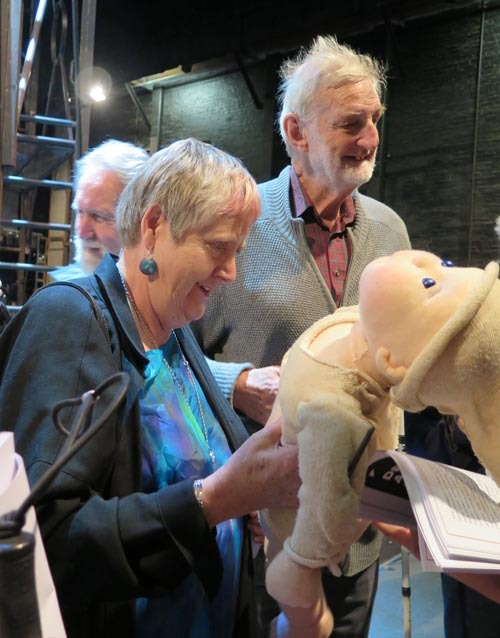 Exploring the set, costumes and props while talking to the actors, who generously give their time before a performance, does nothing to dispel the theatre experience. It intensifies, deepens and enriches it, creating a powerful pathway for blending our mundane reality and the authenticity of the imagined world. The presence of the cement mixer, and the collapsing building resonated for me with the Christchurch earthquakes, an unintended and unsettling take on the "bring it all down" destruction of a wicked world. The finale was a powerful climax. I appreciated details such as the faint smell of the smoke and the uncomfortable gut feel of the loud sound at times, as well as the occasional spilling of the action into the audience. We had good seats in the stalls, which was a real plus. Having good seats rather than being relegated to the back row or the side means better sound quality, and enables those of us with some useful vision to make the most of it. The head sets were great, comfortable and with no cords to tangle with the monocular I wear on a cord round my neck at such events. I had a little trouble with the on/off switch, very minor in the scheme of things. I am fortunate because I have always been able to attend theatre, music and other cultural events. For some disabled people this is still not the norm. I particularly enjoy performances that encourage thought and reflection beyond the event itself. This richness and depth of cultural experience is as important to disabled people in my view as access to education, participation in sport, equal opportunity in the workplace and family life. Arts experience brings pleasure, even joy, escape from sometimes difficult, limiting and constrained circumstances into other worlds, and exploration and understanding of our common humanity. More please. There’s room for growth in this audience. 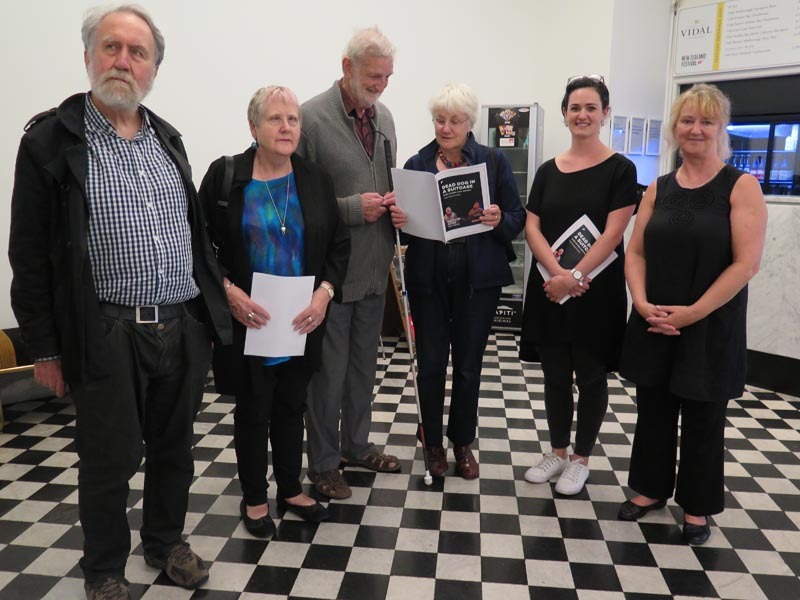 Thanks to Arts Access Aotearoa, the New Zealand Festival of the Arts (and Tom) and, of course, the Kneehigh Theatre Company for a quality performance. Also thanks to CQ Hotels Wellington for sponsoring the New Zealand Festival's Accessibility Programme. Original generation time 1.7080 seconds. Cache Loaded in: 0.0537 seconds.